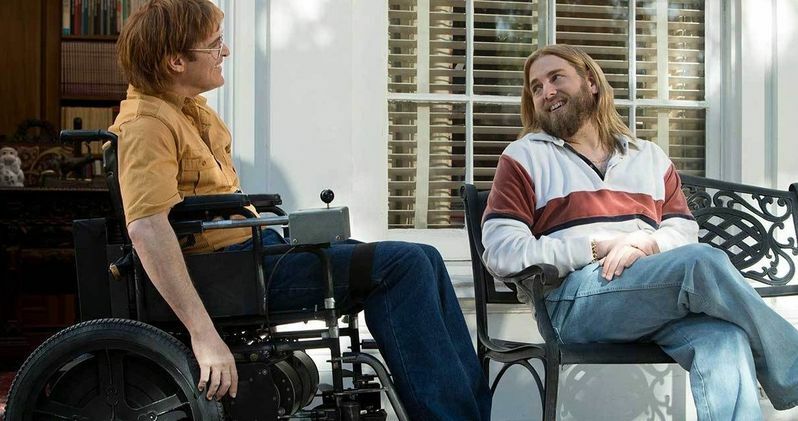 Amazon Studios has released the first trailer and poster for Don't Worry, He Won't Get Far on Foot, which is slated for theatrical release on May 11, 2018. For those who will be in Park City, Utah for the Sundance Film Festival later this week, this film will have its world premiere screening on Friday, January 19, before heading overseas to the Berlin International Film Festival next month. While we still have a few months until this true story adaptation hits theaters, this could certainly make a big splash at Sundance in just a few short days. After Portland slacker John Callahan (Joaquin Phoenix) nearly loses his life in a car accident, the last thing he intends to do is give up drinking. But when he reluctantly enters treatment, with encouragement from his girlfriend (Rooney Mara) and a charismatic sponsor (Jonah Hill), Callahan discovers a gift for drawing edgy, irreverent newspaper cartoons that develop a national following and grant him a new lease on life. Based on a true story, this poignant, insightful and often funny drama about the healing power of art is adapted from Callahan's autobiography and directed by two-time Oscar nominee Gus Van Sant. John Callahan was just 21 years old when he became a quadriplegic, with the car accident happening after a day of drinking, with his car being driven by a man he was bar-hopping with. He grew up in The Dalles, about 80 miles east of Portland, and, as it's revealed in the trailer, he started drinking at the age of 13, which he revealed later in life was to hide the pain from being sexually abused by a female teacher when he was just eight years old. After going through extensive rehabilitation following the spinal cord injury caused by the car accident, John Callahan gave up drinking at the age of 27. Instead of drinking, he turned to art, with a minimalistic style caused by Callahan holding the pen between both of his hands. For 27 years, his cartoons appeared in the Portland newspaper Willamette Week, and the taboo subject matter of his cartoons often lead to protests and boycotts against the newspaper. There were also two animated cartoon shows based on his work, the 2000 Nickelodeon series Pelswick, which ran for three seasons from 2000 to 2002, and Quads, a Canadian and Australian co-production that maintained the politically incorrect nature of his artwork. Callahan was the subject of the 2005 documentary Touch Me Someplace I Can Feel and he was also a songwriter, releasing the 2006 CD Purple Winos in the Rain. John Callahan passed away in 2010 at age 59, following surgery for chronic bed sores. The supporting cast include Jack Black, Carrie Brownstein, Beth Ditto and Kim Gordon, with Gus Van Sant directing from a script he wrote, based on a story by John Callahan and Gus Van Sant. Amazon Studios has set a May 11 release date, putting it up against Action Point, Paramount's action-comedy starring Johnny Knoxville, Breaking In, Universal's action-thriller starring Gabrielle Union and Life of the Party, Warner Bros. comedy starring Melissa McCarthy and Gillian Jacobs. Take a look at the new trailer and poster below, courtesy of Amazon Studios YouTube. Did Chris Evans Just Confirm This Long-Standing Avengers: Endgame Theory?